One of our Trustees, Rebecca, joined us for the first time in a Wheelchair Dance Class, here’s what she thought! The lights dim, music flares and the click of heels begin. This is ballroom dancing! I have always had a passion for dance since I was a small child. Watching dancers glide across the dance floor with such elegance and grace, or moving so quickly that watching their feet makes you dizzy! Plus the feathers, the sequins, and the dramatic make up – what’s not to love? So when I was invited to join a Strictly Wheels dance class, as a standing dancer, I jumped at the chance. I have been an active dancer since the age of four, doing the usual childhood classes of ballet, tap and modern. However, as an adult it has been a couple of years since I have taken part in a class. 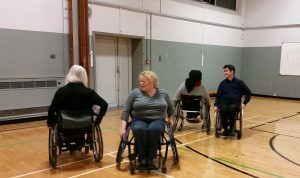 So I was a little nervous, as I wasn’t sure what to expect from a wheelchair dance class. However, my nerves soon disappeared as I received a warm welcome from Gary, Paula and my fellow dancers and within minutes we were on the dance floor. Our warm up started with a line dance, which was a great laugh and after a few minutes of watching Gary strut his stuff we were soon into the swing of it. A Sequence Waltz soon followed and this was my first opportunity to dance as part of a couple. Through the dance we learnt the correct hold, positioning and rhythm (as well as the steps). What struck me was there is not a lot of difference between dancing with a standing dancer or a wheelchair dancer; it is all about ensuring you have technique, trust and a good rapport. Our final dance, the samba , was an exhilarating, exciting dance that’s fast – really fast! My feet went everywhere they shouldn’t, and each time I thought I had mastered the steps I ended up facing in the wrong direction. But time and practice will help; I am determined to get it right! Each dancer was given equal attention and support, however, it was evident that this attention wasn’t due to class size but Gary and Paula’s style of teaching. Gary would jump in a wheelchair to go over moves, and Paula was on hand to give my dance partner and I tips on making turns tighter and cleaner. I never felt silly for getting things wrong, and they were patient and had helpful tips. I tend to always take too larger steps when I dance, but Gary explained moves should not go outside of my shoulder width – simple solution and it works! My dance partner asked if the dances were modified based on people’s disability, and I was delighted to learn they are tweaked to account for dancers’ ability, rather than disability – using what works! 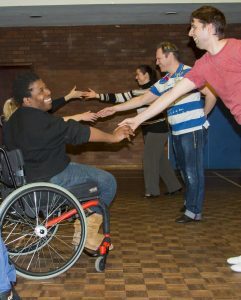 Whether a wheelchair dancer, a standing dancer, an amateur or a novice, I would recommend the classes to everyone. It was a great night; I kept fit, learnt new skills and started some nice friendships. Personally I can’t wait for next week, and who knows in time I might be buying some sequins and feathers for my first competition!